A new Windows 10 2-in-1 will be coming out in November from Eve Technologies and will be called the Eve V. The device will launch via an Indiegogo campaign and Intel has invested their resources in the project. The Eve V looks awfully like the Surface Pro and rumors are that it will have an Intel 7th gen processor, a 12 inch IPS LCD display, around 16GB RAM and 512GB storage. 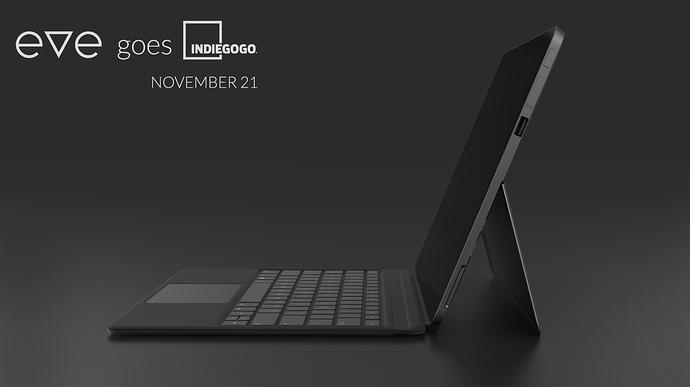 Looking at the picture, the Eve V will also have a type cover and the final pricing will be revealed in November. See more about the product here.